Conservatives opposed to the Affordable Care Act have over-emphasized the initial start-up problems with the exchanges, making false projections that Obamacare will fail. That appears highly unlikely. We are seeing many people obtain health coverage who have not been able to obtain coverage in the past, and the number is expected to grow as we get closer to the sign-up deadlines. Insurance companies can no longer drop people due to developing medical problems. Insurance plans now cover preventative studies which they did not cover before, and plans which took premiums without providing real medical coverage are being eliminated. All this can be counted as successes for Obamacare. The biggest player in the Affordable Care Act’s online insurance marketplaces delivered encouraging news to Obamacare supporters Wednesday. After weeks of uncertainty about how many people have been applying for coverage that started Jan. 1, their age spread and whether or not they’re paying premiums, WellPoint disclosed higher-than-expected early membership growth and said it expects to make money on the new enrollees. It’s the most substantial information so far on how a key part of the health law is working out. “We do feel good about what we’ve seen thus far on the exchanges,” WellPoint CEO Joseph Swedish told stock analysts on a conference call to report 2013 financial results. “While it is early, we are encouraged by the level of applications we’ve received” as well as by the health-risk profiles of new members, he said. As of last week about 500,000 people had applied for individual policies, mostly through its Anthem Blue Cross plans. The company expects another surge in late March, when enrollment closes for most people. Most are new members, not customers rolling over previous WellPoint insurance. What WellPoint doesn’t know is if they were previously uninsured or had coverage somewhere else. More than four-fifths applied through the subsidized, often-troubled online portals run by states or the federal government. The others enrolled directly with the company. Thanks to computer troubles, WellPoint is still processing applications this week for coverage effective Jan. 1. Most applicants had paid the first month’s premium, “but we’re not at what I’ll call a vast majority yet,” said chief financial officer Wayne DeVeydt. New members are older on average than the general population but not more so than expected. WellPoint priced its plans anticipating an older and presumably sicker mix, executives said. Mitch McConnell might be vulnerable in Kentucky over his opposition to the Affordable Care Act. Ezekiel J. Emanuel explained how the Republican proposal for health care provides less benefits, increase the chances of people being denied coverage for pre-existing conditions, will lead to higher taxes for those receiving insurance through employers, and will lead to higher costs for buying their own coverage. On the other hand, from the Republican perspective, it isn’t Obamacare (although it copies many features from it). The lowest unemployment rate in over five years. A rebounding housing market. A manufacturing sector that’s adding jobs for the first time since the 1990s. More oil produced at home than we buy from the rest of the world – the first time that’s happened in nearly twenty years. Our deficits – cut by more than half. And for the first time in over a decade, business leaders around the world have declared that China is no longer the world’s number one place to invest; America is. That’s why I believe this can be a breakthrough year for America. Let’s do more to help the entrepreneurs and small business owners who create most new jobs in America. Over the past five years, my administration has made more loans to small business owners than any other. But the debate is settled. Climate change is a fact. He is right about climate change, but the debate is only settled in terms of the scientific knowledge. Climate change is a fact. So is evolution. And the earth is round. Try to convince the Republicans. Already, because of the Affordable Care Act, more than three million Americans under age 26 have gained coverage under their parents’ plans. More than nine million Americans have signed up for private health insurance or Medicaid coverage. And here’s another number: zero. Because of this law, no American can ever again be dropped or denied coverage for a preexisting condition like asthma, back pain, or cancer. No woman can ever be charged more just because she’s a woman. And we did all this while adding years to Medicare’s finances, keeping Medicare premiums flat, and lowering prescription costs for millions of seniors. Obama said little about the problems caused by Republican obstructionism, but did mention the “forty-something votes to repeal a law that’s already helping millions of Americans.” I believe the exact number is forty-seven votes to repeal the Affordable Care Act. It is time to do away with workplace policies that belong in a “Mad Men” episode. The official Republican response was rather empty, and there were also two Tea Party responses. The bulk of the opposition I saw to Obama on line (and in an op-ed by Ted Cruz) has been to the use of executive orders, ignoring how much fewer he has used than his predecessors. Where were all the conservatives now complaining about Executive power during the Bush years, when Bush went far further than Obama is contemplating? I doubt their complaints will receive much sympathy from swing voters (the few who exist). As I pointed out recently, voters are realizing that the Republicans are responsible for gridlock, even if the media often overlooks this in their efforts at appearing objective by treating both parties equally when they are not mirror images of each other. All in all, the address was liberal but hardly ground-breaking. 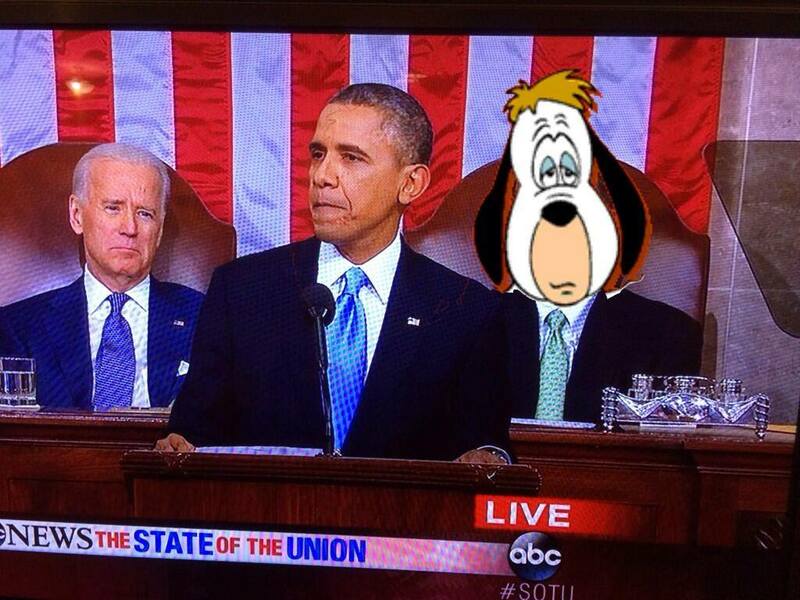 The Monkey Cage has compared every SOTU address since 1986 based upon ideology. This year’s speech was placed around the middle of previous addresses from Obama and Bill Clinton. What I really found interesting about this chart was how far the Republicans moved to the right under Bush. 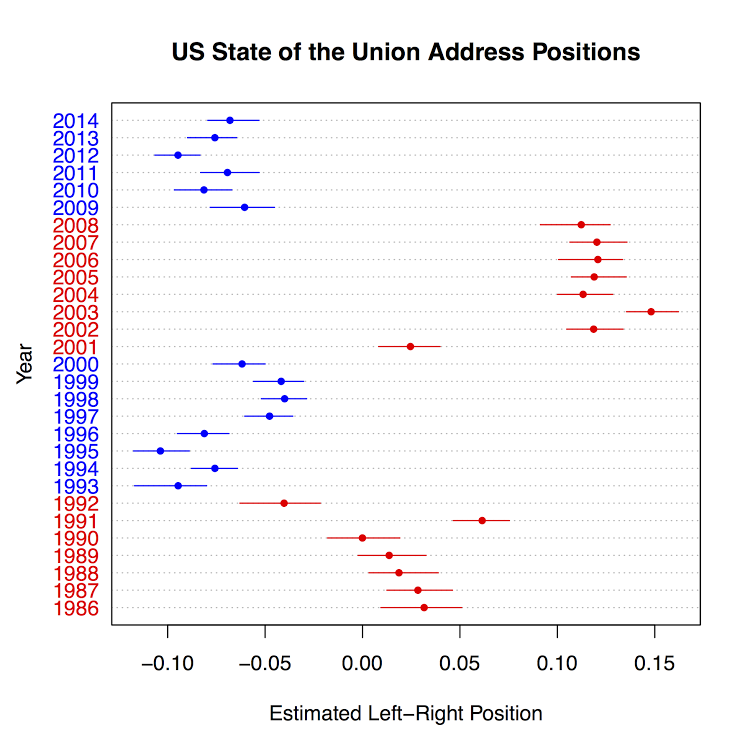 State of the Union addresses are hardly an exact measurement of the ideology of a president, but it is interesting that Ronald Reagan and George H. W. Bush are far closer to the two Democratic presidents compared to George W. Bush. George W. Bush Started out comparable to the previous Republican presidents in his first speech, then moved significantly to the right. Maybe this was the result of 9/11. If nothing else, I was happy that it wasn’t Mitt Romney giving the speech. I’m imagining Mitt Romney spending the evening going up and down in his car elevator. I couldn’t resist staring with the above picture which captures John Boehner, even if he isn’t orange enough. I did feel that his green tie did clash with his orange face.